Tap water costs less than a penny per gallon – a true bargain considering the energy and expertise it takes to treat and deliver safe and reliable water to homes and businesses day in and day out. But like many basic services today, the cost of treating and delivering water is going up for several reasons. Increasingly stringent drinking water regulations have made it necessary for many water suppliers to invest in costly new treatment technologies which adds significantly to the cost of providing water. Many local and regional water systems were built decades ago. Repairing and upgrading aging pipelines, pumps, reservoirs and other facilities can account for a significant portion of monthly water bills. It takes lots of electricity to pump, treat and deliver water. 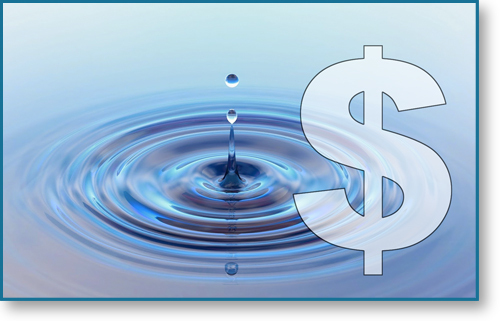 Rising costs for energy directly affect the cost of delivering water to consumers. Investing in new water supplies. Local and regional water agencies are investing billions of dollars for water recycling, conservation programs and securing additional water supplies to stretch their water supply portfolios and increase reliability. Additional investments are required under state legislation. Monthly water bills may reflect a portion of these costs. Debilitating invasive species such as quagga mussels, which can clog waterways and distribution systems, have been an unforeseen strain on some water agencies’ budgets requiring the expenditure of millions of dollars annually to contain the spread of invasive species. Besides delivering safe, reliable water to your homes and businesses every day 24/7, water agencies are responsible for providing additional services, such as responding to incidents, monitoring and testing, ongoing maintenance and investments, safety programs and communications and planning for future needs. Customers of public water agencies get more than just a product for their money. Simply put, they are getting one of the best deals around.